박완경, 윤명숙,(2015).대학생의 사이버 폭력경험과 대인관계능력의 관계에 미치는 성인애착의 매개효과.정신보건과 사회사업,43(4),5-30. 본 연구는 최근 들어 증가하고 있는 사이버 따돌림, 사이버 언어폭력 등 사이버 관계에서 경험하는 사이버 폭력이 대인관계능력에 미치는 영향과 성인애착의 매개효과를 검증하기 위한 연구이다. 이를 위해 현재 4년제 대학교에 재학 중인 대학생 623명을 대상으로 구조방정식을 활용하여 분석하였다. 연구결과 첫째, 전체 대상자의 64.2%가 사이버 폭력을 경험하고 있는 것으로 나타났다. 둘째, 대학생들의 사이버 폭력경험에 따른 성인 애착과 대인관계 수준은 유의미한 차이가 있는 것으로 나타났다. 즉, 사이버 폭력을 경험한 집단은 성인애착의 하위유형인 불안애착수준이 높은 것으로 나타났으며, 대인관계능력 점수는 낮은 것으로 나타났다. 셋째, 대학생의 사이버 폭력경험과 대인관계능력 간관계에서 성인애착은 완전매개효과를 가지는 것으로 나타났다. 즉, 사이버 폭력을 경험한 대학생의 경우 불안수준이 높아지고, 성인애착불안수준이 높아질수록 대인관계능력 수준이 낮아지는 것으로 나타났다. 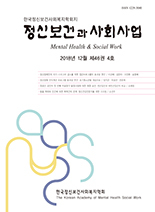 이러한 연구결과를 토대로 사이버 폭력을 예방하고, 대학생의 성인애착과 대인관계능력 증진을 위한 정신보건사회복지의 실천적 개입 방안을 제시하였다. The purpose of this study was to identify moderating role of adult attachment on the relationship between cyber violence and interpersonal relation abilities among university students. Data were obtained from 623 university students and collected data were analyzed by using structural equation model. The research findings were as follows: First, this study found 64.2% prevalence rates of cyber bullying. Second, cyber violence group showed significant difference on adult attachment and interpersonal relation abilities. The cyber violence group showed more higher anxiety level and more lower interpersonal relation abilities. Third, adult attachment worked as full mediators between the cyber violence and interpersonal relation abilities. The implications and limitations of these findings were discussed and directions for future studies were also proposed.